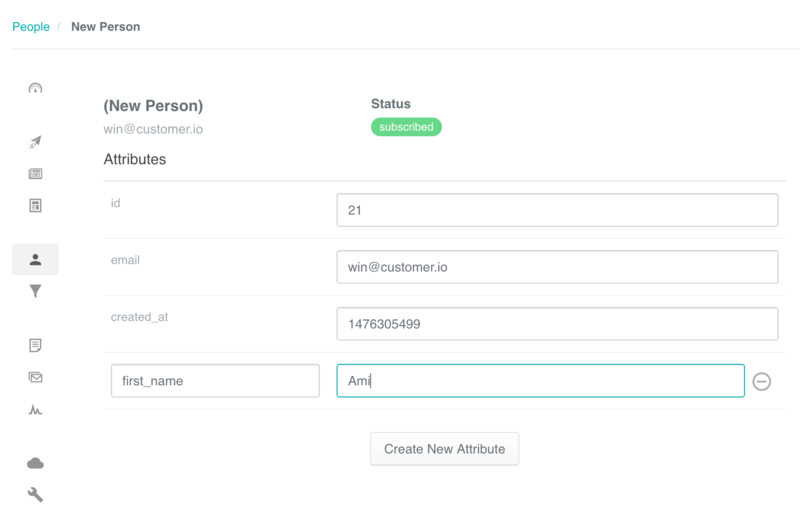 While you're generally going to integrate with your Customer.io account to send profile data, sometimes you need to add a user or update an existing person manually, just for testing or other ad-hoc reasons. You can use our REST API for this, or you can add them via the UI. Fill out the form. If this is a temporary user for testing you can go ahead and make up an id or use an email address. However, if this is a permanent addition, the id will need to match the id in your database. Save! That new person will now exist in your Customer.io database. Once you confirm the delete or unsubscribe, you're finished editing. If you'd like to update their attributes or add new ones, click the Attributes tab, followed by the Edit Attributes button. Don't forget to save when you're done!